Virtual reality (VR) is technology which allows a user to interact with a computer-simulated environment through one's senses. The term "simulated reality" is also used in literature and science fiction. A social environment created by internet-based simulation game, such as Second Life, may be considered by some as a type of virtual reality. Most current virtual reality environments are primarily visual in nature, displayed either on a computer screen or through stereoscopic displays, but some simulations include additional sensory information, such as sound. Some advanced, haptic systems now include tactile information, generally known as force feedback, in medical and gaming applications. Users can interact with a virtual environment or a virtual artifact (VA) either through the use of standard input devices such as a keyboard and mouse, or through multimodal devices such as a wired glove, the Polhemus boom arm, and omnidirectional treadmill. 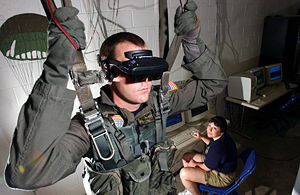 The simulated environment can be similar to the real world, as in simulations for pilot or combat training, or it can differ significantly from reality, as in VR games. In practice, it is currently very difficult to create a high-fidelity virtual reality experience, largely due to technical limitations on processing power, image resolution and communication bandwidth. However, those limitations are expected to eventually be overcome as processor, imaging and data communication technologies become more powerful and cost-effective over time. "Reality" is neither exclusively objective nor subjective, physical nor mental. Rather, reality can be understood in the relationship between these two poles of subjectivity and objectivity. Virtual reality signifies a realm of reality that is generated by computer technology. Virtual reality signifies technologies that can generate a semi-real sphere of the mind by combining human sense stimuli, such as visual, auditory, and tactile sensation. Current technologies focus on the visual and auditory senses. Accordingly, virtual reality signifies an environment created or generated by such technology. Such an environment is distinguished from physical reality; it is a realm generated by the imagination based on sensory stimuli. Virtual reality in this sense is a solitary, non-social realm, where the objects of interaction are limited those generated by computers. Virtual reality can also signify a social realm generated by internet-based communication networks. A typical example is an internet-based simulation computer game such as Second Life. Users can generate another identity and engage in all kinds of human activities within the simulated game environment. Social networking, telepresence, and mixed reality (MR) are some emerging environments that are closely related with virtual reality. As the term "space" connotes, cyberspace is the broadest web based sphere where social, cultural, and economic activities are conducted. As is raised in various science fiction films and novels, the concept of virtual reality raises many issues about the nature of reality and humans' perception of it. Some issues include the relationship between sense perception and cognitive understanding, the act of interpretation, and metaphysical inquiries into the nature of reality. The term artificial reality, coined by Myron Krueger, has been in use since the 1970s but the origin of the term virtual reality is uncertain. It has been credited to The Judas Mandala, a 1982 science fiction novel by Damien Broderick, where the context of use is somewhat different from that defined above. The earliest use cited by the Oxford English Dictionary is in a 1987 article entitled "Virtual reality," but the article is not about VR technology. The VR developer Jaron Lanier claims that he coined the term. The concept of virtual reality was popularized in mass media by movies such as Brainstorm and The Lawnmower Man (and others mentioned below), and the VR research boom of the 1990s was motivated in part by the non-fiction book Virtual Reality by Howard Rheingold. The book served to demystify the subject, making it more accessible to less technical researchers and enthusiasts, with an impact similar to what his book The Virtual Community had on virtual community research lines closely related to VR. Multimedia: From Wagner to Virtual Reality, edited by Randall Packer and Ken Jordan and first published in 2001, explores the term and its history from an avant-garde perspective. The inner mounting "cap" for the head-mounted display of Aladdin's Magic Carpet Ride at DisneyQuest. Users would don this cap and adjust it while waiting, and then snap the HMD onto the cap. It is unclear exactly where the future of virtual reality is heading. In the short run, the graphics displayed in the HMD will soon reach a point of near realism. The audio capabilities will move into a new realm of three dimensional sound. This refers to the addition of sound channels both above and below the individual. The virtual reality application of this future technology will most likely be in the form of over ear headphones. Within existing technological limits, sight and sound are the two senses which best lend themselves to high quality simulation. There are however attempts being currently made to simulate smell. The purpose of current research is linked to a project aimed at treating Post Traumatic Stress Disorder (PTSD) in veterans by exposing them to combat simulations, complete with smells. Although it is often seen in the context of entertainment by popular culture, this illustrates the point that the future of VR is very much tied into therapeutic, training, and engineering demands. Given that fact, a full sensory immersion beyond basic tactile feedback, sight, sound, and smell is unlikely to be a goal in the industry. It is worth mentioning that simulating smells, while it can be done very realistically, requires costly research and development to make each odor, and the machine itself is expensive and specialized, using capsules tailor made for it. Thus far basic, and very strong smells such as burning rubber, cordite, gasoline fumes, and so forth have been made. Something complex such as a food product or specific flower would be prohibitively expensive (see the perfume industry as an example). In order to engage the other sense of taste, the brain must be manipulated directly. This would move virtual reality into the realm of simulated reality like the "head-plugs" used in The Matrix. Although no form of this has been seriously developed at this point, Sony has taken the first step. 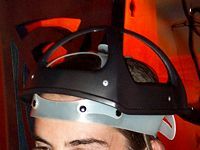 On April 7, 2005, Sony went public with the information that they had filed for and received a patent for the idea of the non-invasive beaming of different frequencies and patterns of ultrasonic waves directly into the brain to recreate all five senses. Sony has not conducted any tests as of yet and says that it is still only an idea. Virtual reality will be integrated into daily life and activity and will be used in various human ways. Techniques will be developed to influence human behavior, interpersonal communication, and cognition (that is, virtual genetics). As we spend more and more time in virtual space, there will be a gradual “migration to virtual space,” resulting in important changes in economics, worldview, and culture. The design of virtual environments may be used to extend basic human rights into virtual space, to promote human freedom and well-being, and to promote social stability as we move from one stage in socio-political development to the next. The use of VR in heritage and archaeology has enormous potential in museum and visitor center applications, but its use has been tempered by the difficulty in presenting a "quick to learn" real time experience to numerous people any given time. Many historic reconstructions tend to be in a pre-rendered format to a shared video display, thus allowing more than one person to view a computer generated world, but limiting the interaction that full-scale VR can provide. The first use of a VR presentation in a Heritage application was in 1994 when a museum visitor interpretation provided an interactive "walk-through" of a 3D reconstruction of Dudley Castle in England as it was in 1550. This comprised of a computer controlled laserdisc based system designed by British based engineer Colin Johnson. Mass media has been a great advocate and perhaps a great hindrance to its development over the years. 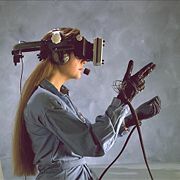 During the research “boom” of the late 1980s into the 1990s the news media’s prognostication on the potential of VR—and potential overexposure in publishing the predictions of anyone who had one (whether or not that person had a true perspective on the technology and its limits)—built up the expectations of the technology so high as to be impossible to achieve under the technology then or any technology to date. Entertainment media reinforced these concepts with futuristic imagery many generations beyond contemporary capabilities. Many science fiction books and movies have imagined characters being "trapped in virtual reality." One of the first modern works to use this idea was Daniel F. Galouye's novel Simulacron-3, which was made into a German teleplay titled Welt am Draht ("World on a Wire") in 1973 and into a movie titled The Thirteenth Floor in 1999. Other science fiction books have promoted the idea of virtual reality as a partial, but not total, substitution for the misery of reality (in the sense that a pauper in the real world can be a prince in VR), or have touted it as a method for creating breathtaking virtual worlds in which one may escape from Earth's now toxic atmosphere. They are not aware of this, because their minds exist within a shared, idealized virtual world known as Dream Earth, where they grow up, live, and die, never knowing the world they live in is but a dream. Stanislaw Lem wrote in early 1960 a short story "dziwne skrzynie profesora Corcorana" in which he presented a scientist, who devised a completely artificial virtual reality. Amongst the beings trapped inside his created virtual world, there is also a scientist, who also devised such machines creating another level of virtual world. The Piers Anthony novel Killobyte follows the story of a paralyzed cop trapped in a virtual reality game by a hacker, whom he must stop to save a fellow trapped player with diabetes slowly succumbing to insulin shock. This novel toys with the idea of both the potential positive therapeutic uses, such as allowing the paralyzed to experience the illusion of movement while stimulating unused muscles, as well as virtual realities' dangers. An early short science fiction story—"The Veldt"—about an all too real "virtual reality" was included in the 1951 book, The Illustrated Man, by Ray Bradbury and may be the first fictional work to fully describe the concept. The Otherland series of 4 novels by Tad Williams . Set in the 2070's, it shows a world where the Internet has become accessible via virtual reality and has become so popular and somewhat commonplace that, with the help of surgical implants, people can connect directly into this future VR environment. The series follows the tale of a group of people who, while investigating a mysterious illness attacking children while in VR, find themselves trapped in a virtual reality system of fantastic detail and sophistication unlike any the world has ever imagined. Other popular fictional works that use the concept of virtual reality include William Gibson's Neuromancer which defined the concept of cyberspace, Neal Stephenson's Snow Crash, in which he made extensive reference to the term "avatar" to describe one's representation in a virtual world, and Rudy Rucker's The Hacker and the Ants, in which programmer Jerzy Rugby uses VR for robot design and testing. Another use of VR is in the teenage book The Reality Bug by D.J MacHale, where the inhabitants of a territory become trapped in a Virtual world, which used to be perfect but is now filled with their worst nightmares. Steven Lisberger's 1982 movie, TRON was the first mainstream Hollywood picture to explore the idea. One year later, it would be more fully expanded in the Natalie Wood film Brainstorm. Probably the most famous film to popularize the subject was more recently done by the Wachowski Brothers in 1999's The Matrix. The Matrix was significant in that it presented virtual reality and reality as often overlapping, and sometimes indistinguishable. Other films that incorporate the idea of virtual reality into its story include Total Recall, The Lawnmower Man, Avalon, Disclosure, and Virtuosity. In 1991, the company (originally W Industries, later renamed) Virtuality licenced the Amiga 3000 for use in their VR machines and released a VR gaming system called the 1000CS. This was a stand-up immersive HMD platform with a tracked 3D joystick. Internet-based simulation games such as Second Life also create a social environment where users can assume various roles and engage with other users. The social environment created on the internet may be seen by some as a type of virtual reality. David Em was the first fine artist to create navigable virtual worlds in the 1970s. His early work was done on mainframes at III, JPL, and Cal Tech. Jeffrey Shaw explored the potential of VR in fine arts with early works like Legible City (1989), Virtual Museum (1991), Golden Calf (1994). Canadian artist Char Davies created immersive VR art pieces Osmose (1995) and Ephémère (1998). Maurice Benayoun's work introduced metaphorical, philosophical or political content, combining VR, network, generation and intelligent agents, in works like Is God Flat (1994), The Tunnel under the Atlantic (1995), World Skin (1997). Other pioneering artists working in VR have included Rita Addison, Rebecca Allen, Perry Hoberman, Jacki Morie, and Brenda Laurel. A side effect of the chic image that has been cultivated for virtual reality in the media is that advertising and merchandise have been associated with VR over the years to take advantage of the buzz. This is often seen in product tie-ins with cross-media properties, especially gaming licenses, with varying degrees of success. The NES Power Glove by Mattel from the 1980s was an early example as well as the U-Force and later, the Sega Activator. Marketing ties between VR and video games are not to be unexpected, given that much of the progress in 3D computer graphics and virtual environment development (traditional hallmarks of VR) has been driven by the gaming industry over the last decade. TV commercials featuring VR have also been made for other products, however, such as Nike's "Virtual Andre" in 1997, featuring a teenager playing tennis using a goggle and gloves system against a computer generated Andre Agassi. While its use is still not widespread, virtual reality is finding its way into the training of health care professionals. Use ranges from anatomy instruction to surgery simulation. Annual conferences are held to examine the latest research in utilizing virtual reality in the medical fields. The primary use of VR in a therapeutic role is its application to various forms of exposure therapy, ranging from phobia treatments, to newer approaches to treating PTSD. A very basic VR simulation with simple sight and sound models has been shown to be invaluable in phobia treatment (notable examples would be various zoophobias, and acrophobia) as a step between basic exposure therapy such as the use of simulacra and true exposure. A much more recent application is being piloted by the U.S. Navy to use a much more complex simulation to immerse veterans (specifically of Iraq) suffering from PTSD in simulations of urban combat settings. While this sounds counter intuitive, talk therapy has limited benefits for people with PTSD, which is now thought by many to be a result of changes either to the limbic system in particular, or a systemic change in stress response. Much as in phobia treatment, exposure to the subject of the trauma or fear seems to lead to desensitization, and a significant reduction in symptoms. The real estate sector has used the term "virtual reality" for websites that offer panoramic images laced into a viewer such as QuickTime Player in which the viewer can rotate to see all 360 degrees of the image. Virtual reality has been heavily criticized for being an inefficient method for navigating non-geographical information. At present, the idea of ubiquitous computing is very popular in user interface design, and this may be seen as a reaction against VR and its problems. In reality, these two kinds of interfaces have totally different goals and are complementary. The goal of ubiquitous computing is to bring the computer into the user's world. The current trend in VR is to merge the two user interfaces to create a fully integrated experience. Another obstacle is the headache due to eye strain, caused by the VR headsets. ↑ Yaakov Garb, Virtual reality, Whole Earth Review 57 (1987): 118ff. ↑ Jaron Lanier, Brief Biography. Retrieved November 14, 2008. ↑ Horsnell, Michael, Sony takes 3-D cinema directly to the brain, Times Online, April 7, 2005. Retrieved November 14, 2008. ↑ University Village Press, Introduction to the Future of Virtual Reality. Retrieved November 14, 2008. ↑ Exrenda, Virtual Tours of Dudley Castle archive. Retrieved November 14, 2008. ↑ UCSD, What is Anatomic VisualizeR© ? Retrieved November 14, 2008. ↑ OHSU, New Virtual Reality Surgery Simulator Hones Surgeons' Skills, Improves Patient Safety, Oregon Health & Science University, June 20, 2005. Retrieved November 14, 2008. ↑ Nextmed, DESIGN FOR THE WELL BEING. Retrieved November 14, 2008. Earnshaw, Rae A., M. A. Gigante, and H. Jones. Virtual Reality Systems. London: Academic Press, 1993. ISBN 9780122277481. Heim, Michael. The Metaphysics of Virtual Reality. New York: Oxford University Press, 1993. ISBN 9780195092585. Higgins, Tony. Imaging the Past: Electronic Imaging and Computer Graphics in Museums and Archaeology. London: British Museum, 1996. ISBN 0861591143. Hoffman, H. G. 2004. "Virtual-Reality Therapy." Scientific American 291 (2): 58-65. Hudson, Laura. 2001. "From Theory to (Virtual) Reality." Library Journal 1215: 12-15. Morse, Margaret. Virtualities Television, Media Art, and Cyberculture. Bloomington: Indiana University Press, 1998. ISBN 9780585025384. Pimentel, Ken, and Kevin Teixeira. Virtual Reality: Through the New Looking Glass. New York: Intel/Windcrest, 1993. ISBN 9780830640652. Rheingold, Howard. Virtual Reality. New York: Summit Books, 1991. ISBN 9780671693633. Wexelblat, Alan. Virtual Reality: Applications and Explorations. Boston: Academic Press Professional, 1993. ISBN 9780127450452. This page was last modified on 22 January 2016, at 17:15.